Hi, welcome to my first blog. This is about our adventure in Puerto Princesa City, Palawan for our first vacation this year after having been to Boracay in July 2010 and Bohol & Panglao Island in October last year. Just a brief facts about the city, Puerto Princesa sprawls across 253,982 hectares of land stretched over 106 kilometers, making it the country’s largest city. Its narrowest breadth is in Bahile, where only 8.5 kilometers of land separate the east and the west coast. In Cebu, when you travel by land from the city to the north or south districts for 2 hours, you’d pass by several other cities or municipalities. But you wouldn’t believe it when I say that when you travel for 2 hours to the west, you’ll still be in Puerto Princesa City. 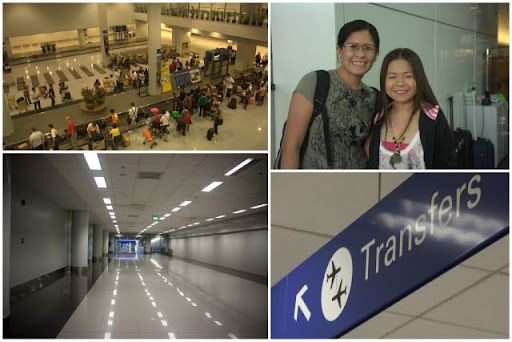 March 11, 2011 – We were supposed to fly directly to Puerto Princesa, Palawan but our flight was rescheduled by Cebu Pacific. So instead we took a Cebu-Manila-Puerto Princesa route. Our flight was at 1200H and we were already in MIA or Mactan International Airport by 1020H. 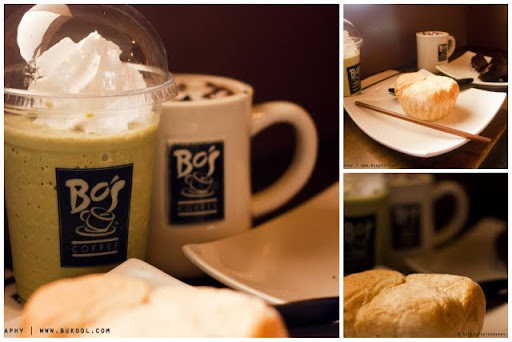 Since I didn’t get to eat breakfast before leaving home, we decided to have light snacks at Bo’s Coffee inside the terminal. I got their “Special” Green Tea while Jeanneth ordered a cup of hot mocha. We also ordered sandwiches to go with our beverages. Total bill: P370.00. At first I thought it was a very tiring trip because we won’t be arriving in Puerto Princesa until 1700H but I guess it was just fine. First time I’ve been on the “controversial” NAIA Terminal 3 as I used to be a PAL Mabuhay Miler and PAL’s located at the “old” Terminal 2. We arrived in Manila at about 1255H. And boy, it was nice! The new terminal I can say is twice as big as Terminal 2, I can actually compare it to LAX Airport in Los Angeles, CA. Our flight to Puerto Princesa is scheduled at 1545H. However, just as I thought, it was delayed by an hour because the plane we were supposed to be on, arrived late. With that we decided to take our lunch at Let’s Chow inside the terminal. Our bill: P360.00. Eventually, we arrived in Puerto Princesa at about 1755H and we were greeted by Kuya Ronald who picked us up from the airport to our hotel/resort. We checked in at the Kawayanan Resort located in L.A. Abaa Road, Bgy San Pedro, 15 minutes from the airport. 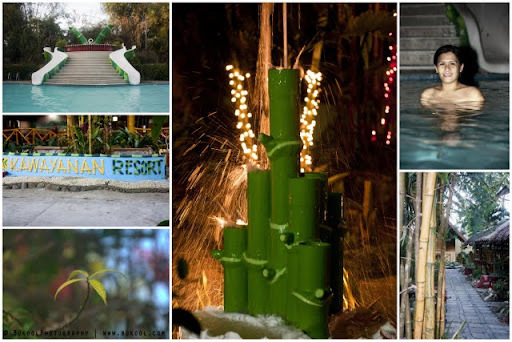 It’s a beautiful place that’s full of, you guessed it right, bamboo trees or kawayan in Filipino language. Its center attraction is their large swimming pool with a couple of slides. But if you need a place to relax, this is the best place to be. The resort only has a total of 13 fully airconditioned rooms. That makes it a quiet place. And when the wind blows, you’ll hear the sound of the swaying trees. Aside from their resort, Kawayanan also have their own travel and tours agency. At Php5,800.00 each, we already got a 4 day-3 night accomodation plus tour packages of Underground River, Honda Bay and a half-day city Tour. The package also includes free breakfast and lunch. So we only spend for one meal a day, dinner. Did I already mention that they also offer free wifi anywhere in the resort (except inside the room) and 32-inch LCD TV, mini-ref, hot & cold shower? And by the way, the package also includes free airport transfers. But the best part of it all is that the place is being managed by the owners themselves. In fact, as soon as we got there, we were greeted by the wife, Ms. Mary Rose, who gave us a few words about the resort and Puerto Princesa City as well. 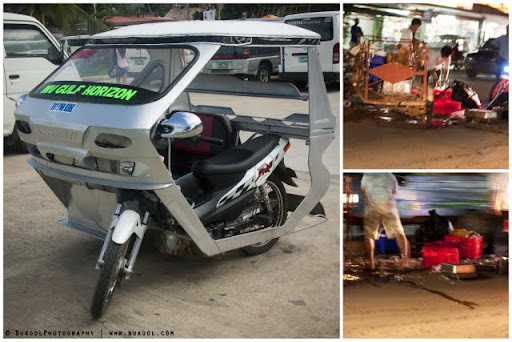 And speaking of dinner, after taking a quick dive on Kawayanan’s large pool, we took a taxi (motorcycle cab) and off we went to the famous Kinabuchs Grill and Bar. Damn, the place was absolutely good! 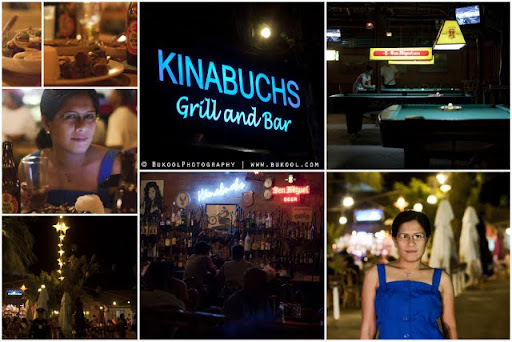 Kinabuchs (owner’s name is Butch, hence the name) is one of the premier places to go in Puerto Princesa, in fact, I also think it is the busiest restaurant in the city too. The place is an open-air type so it’s a smokers haven. They offer the best Filipino food in the city at very affordable prices. We ordered two value meals @ P89.00 each plus Bicol Express and Adobong Pusit. For the value meals, Jeanneth had Grilled Porkchops and I ordered FCLC which stands for Fried Chicken with Lumpia Shanghai. And of course, the night wouldn’t be complete without bottles of our favorite Red Horse Beer. Kinabuchs has pool tables and a very large TV screen along the parking area (where we watched the Japan Tsunami news) but the sad part was, they didn’t have wifi, good thing that I checked in via foursquare at the hotel before we left. Service was A+. In fact, we were attended by the manager himself (I’m not sure if it was Butch himself in disguise, I didn’t have the guts to ask him). He looked for a table for us, cleaned it and took our orders. They also played good music and the place also features a well stuffed sports bar. I’d say for P300.00 per person should be enough to fill your empty stomach with great food you’d never regret. Our total bill: P730.00. Overall expense for meals for the day: P1,460.00. After a good dinner, we went back to our hotel and called it a day. Up next….. Underground River Adventure. Coming soon, my complete gallery of pictures for our Puerto Princesa Experience. Magnificent goods from you, man. I’ve understand your stuff previous to and you are just too great. I really like what you have acquired here, certainly like what you are stating and the way in which you say it. You make it entertaining and you still take care of to keep it wise. I cant wait to read much more from you. This is really a tremendous web site.